Today aims to raise awareness of cardiac arrests (which, by the way, are different to a heart attack) in association with the European Resuscitation Council. Knowing the basic skills of heart resuscitation can make the difference between life and death, that’s why start a heart have created this handy pdf that you can print out as a reminder of the steps you need to take. 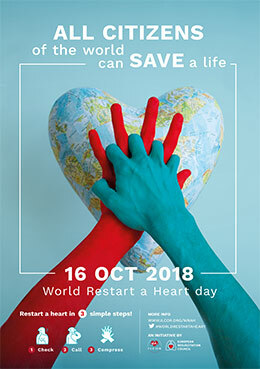 The Restart a Heart website has a whole bevvy of fliers and posters you can use at your disposal on their site. The leaflets and fliers also mention the importance of an AED (short for an automated external defibrillator). The longer the heart stops pumping much needed oxygen to the brain the more likely the casualty is to suffer some form or brain damage.